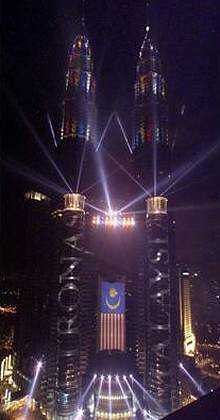 The PETRONAS Twin Towers stand as an integral part of the Kuala Lumpur City Centre (KLCC) project. 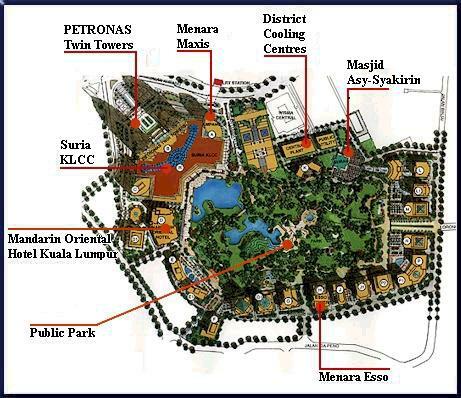 KLCC is masterplanned to provide the capital city with an efficient, modem focus for urban activity, trade and commerce encircling a vast, open green lung. 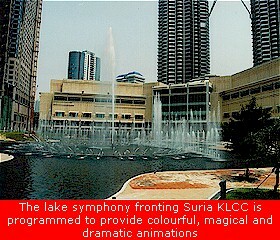 PETRONAS assumed the challenge of developing the project by taking a majority stake in the KLCC development in 1991. 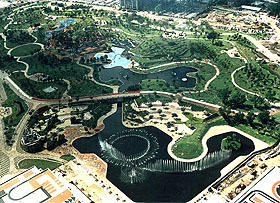 Invitations were then sent to eight esteemed architectural firms worldwide to submit design proposals, for a development of unparalleled vision. Interestingly, it was never specified that the conceptual proposals be for the 'tallest buildings in the world'; simply distinctive. Architecturally, these geometric forms describe 'unity within unity, harmony, stability and rationality'. Upon the eight-pointed stars resulting from the interlocking squares, are eight superimposed semi-circles softening the inner angles. These semicircles are themselves anchored by the arcs of the main structural columns of the buildings. 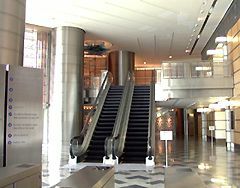 The design details continued to dictate the way in which the buildings would rise in as graceful a fashion as possible. To maintain the vertical axis and tapering of the design, each tower is set back five times in its ascent. At the uppermost floors, the walls are gently sloped inward to taper and contribute visually to the height and the elegant form of horizontal silver ribbons of stainless steel. The writings of Lao Tse, the ancient philosopher and founder of Taoism in China, tell that the reality of a hollow object is in the void and not in the walls. Cesar Pelli, architect of the Towers, has drawn upon the strength of the void between the buildings -- delineating an invisible axis of symmetry. The slender pedestrian bridge spans the space, and its supports frame a portal to the infinite. 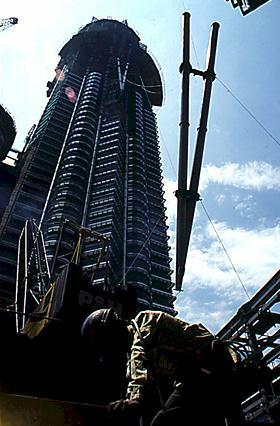 For the architect, it is this void that gives the PETRONAS Twin Towers their sense of grandeur and unique identity. 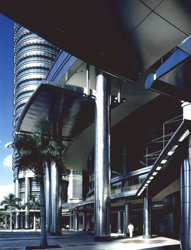 Cesar Pelli & Associates (USA), having succeeded in the invited international competition, conceived of a distinctive architecture that at once embodied the strength of Malaysia, the culture of its people and the corporate requirements of PETRONAS. The 88-storey towers would dominate the north-west corner of the KLCC development. With this brief, the architectural process was initiated from the design of a typical floor-plate for the towers -- derived from the simple geometry of two interlocking squares, an important basis of Islamic design. Gambar jambatan diatas tu...sedang di perbaiki...so..perhatikan bebetul!! Every aspect of the design contributes to the audacious verticality of the Towers. 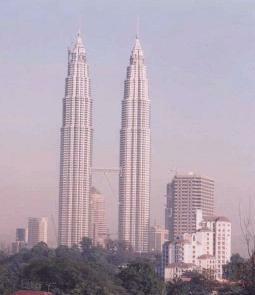 The decision to symmetrically align the Twin Towers and connect them with a spanning bridge emphasised the classical nature of the architectural design.